It's all you can eat pizza for $5 (but it would have cost me $7.50). 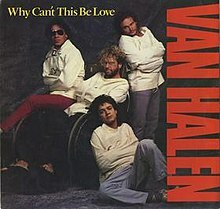 Van Halen, Why Can't This Be Love 1986. Van Hagar's first single with Sammy. This was one of my first songs I heard from them growing up and David Lee Roth is more of a historical reference for me especially his 2012 album with Van Halen. I often wonder with pizza, why can't this be love? Rob Schneider. So many great movies and I especially enjoyed his skits on Saturday Night Live. From "You can do it!" in the Adam Sandler movies, to his "The Richmeister" sketches on SNL, he is in my top 10 comics of all time.